Food, fireworks, Fourth of July festivities … and to tie it all together, five top Drum Corps International units returning to the fabled Rose Bowl Stadium for a special patriotic performance! On July 4 in Pasadena, join the Academy, Blue Devils, Pacific Crest, Phantom Regiment and Santa Clara Vanguard as they take center stage for Americafest 2008, the Rose Bowl's 82nd annual Fourth of July celebration. Festivities run all day long, with food vendors, entertainment, crafts, exhibits and more outside the stadium opening around noon. Tailgate or picnic outside while watching the drum corps warm-up before corps members suit up for their performances in the familiar confines of one of America's most historic stadiums. Rose Bowl gates will open at 6 p.m, and at 7 p.m., the first of the five groups steps off. Fans will be treated to exhibition performances of the five corps' complete competitive programs with special "instant encores" of patriotic tunes following each presentation. And just when you thought your star-spangled Fourth of July celebration couldn't get any more spectacular, the ensembles will combine for a rousing performance of "America the Beautiful," leading into the largest fireworks display in Southern California starting at 9 p.m.
"Fireworks in the Rose Bowl have been a treasured Pasadena tradition for 80 consecutive years. 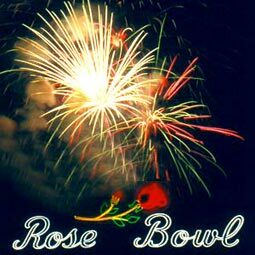 We consider our Fourth of July celebration as one of our core events," says Rose Bowl general manager Darryl Dunn. With thousands of residents from all over California in attendance for this annual Rose Bowl spectacle, a special seating block has been set aside just for Drum Corps International fans. Arrangements have been made to shift the field toward the south end of the stadium to give fans the best possible angle from which to view the drum corps performances and fireworks extravaganza. Surrounding north side seating areas will be blocked off for the safety of fans. Tickets for the special reserved Drum Corps International seating area are only $25. Admission includes access to both the DCI show and the fireworks display. Buy today on DCI.org or call 317.275.1212. Learn more and purchase your tickets today. Check out a photo gallery of the Academy at the 2007 edition of Americafest.